A fair number of students arrive at law school knowing they want to be an attorney, but not what kind. Through classes, mentors, clerkships, and such, they gravitate in one direction or another. Not Rachel Snead, L’19. She knew where she wanted to make a difference well before she decided that law was the best career for doing it: animal welfare. Enter law school, which ticked many of the same boxes for her. 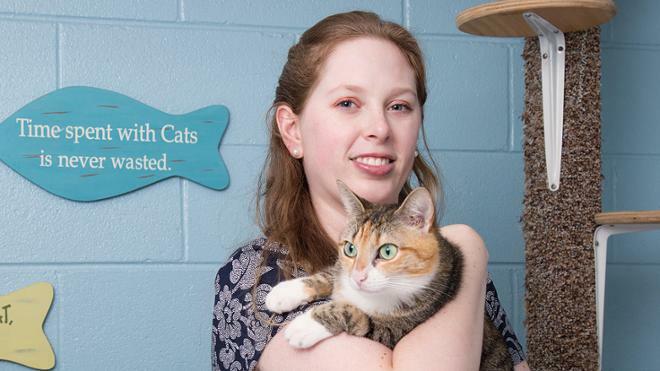 With a little research, she discovered that Virginia — with its animal law unit in the attorney general’s office — was a good place to pursue a career in animal welfare. And Richmond Law — with its animal law course and student-organized Animal Law Society — was the right place to do it. Next year, Snead takes over as the Animal Law Society’s president. She puts its membership at around 30 students, with 10 or so very active in organizing and running events. One recent event — a CLE charmingly called FURisprudence — drew strong attendance, she said. And, like in some other areas of law, the needs of those who benefit from this advocacy are great. And so Snead helps organize and advocate on their behalf at the student level in preparation for a career trajectory she has chosen because, as she tells those who ask, she expects to find it deeply fulfilling. The Animal Law Society is one of three dozen student organizations at Richmond Law, spanning interests from service to affinity groups and practice areas.